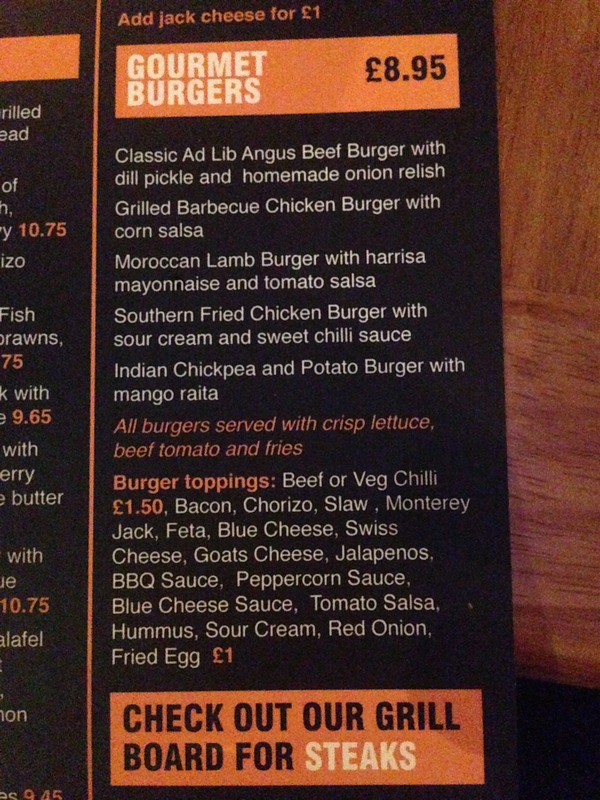 Many consider Ad Lib to be the place that brought the gourmet burger to Glasgow. Many, many years ago, long before ‘James vs. Burger’ was even an idea, I still remember Ad Lib on Hope street being the first place that I ever ate a ‘proper’ burger, with my only other experiences at the time being from typical fast food offerings or student union food. I consider Ad Lib to be where my love of burgers first began all those years ago. 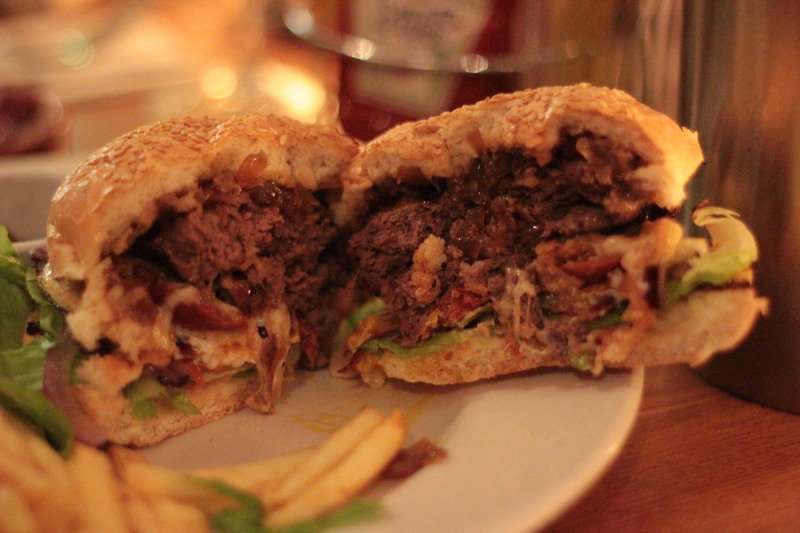 For those who remember, I attempted their ‘Man vs. Food’ style burger challenge back when we first launched the site and, to be honest, I felt so ill after it that I didn’t want to go back for a while. Not because the burger was bad or anything, but it was simply too much. With that experience firmly in the past, I thought that it was time to return to Ad Lib for a new review. I decided to go for the classic burger and customise it a little. From the list of toppings, I added chorizo, Monterey Jack cheese, red onion and a fried egg. On the board in the restaurant, it says that you get to choose between a brioche or seeded bun, but I wasn’t given the option. I wasn’t overly fussed anyway – perhaps I was supposed to mention what I wanted? I actually didn’t notice that there were different bun options available until after I’d ordered. The classic angus burger, with added custom toppings. Presentation-wise, the burger was nice and messy. The cheese, lettuce and other toppings provided a nice cushion for the patty, which also helped the bottom half of the bun remain intact. Before eating, I made sure to spread all of the red onion relish on the bun and if you ever get this burger, I’d recommend you do too – it’s delicious! The burger came with red onion relish and fries. The patty was big, juicy and nicely charred on the outside. It was well-seasoned had a very strong, distinct flavour that actually made it stand out above the many other toppings. The bold-flavour of the thick-cut, fried chorizo complimented the beef very well and the onion relish was a nice, sweet counterpart to finish it all off. The fried egg was really there simply because sometimes fried eggs on burgers just seem so right – and this was one of those times. The egg burst as soon as I took my first bite and ran all over the plate and my hands – and it was awesome. The bun was nicely toasted and didn’t fall apart at all, even with all of the toppings I’d piled on. I actually used the remainder of the bun to mop up the fried egg yolk from the plate and it worked well. I’d have probably preferred the brioche bun offering, but the seeded was still very good. 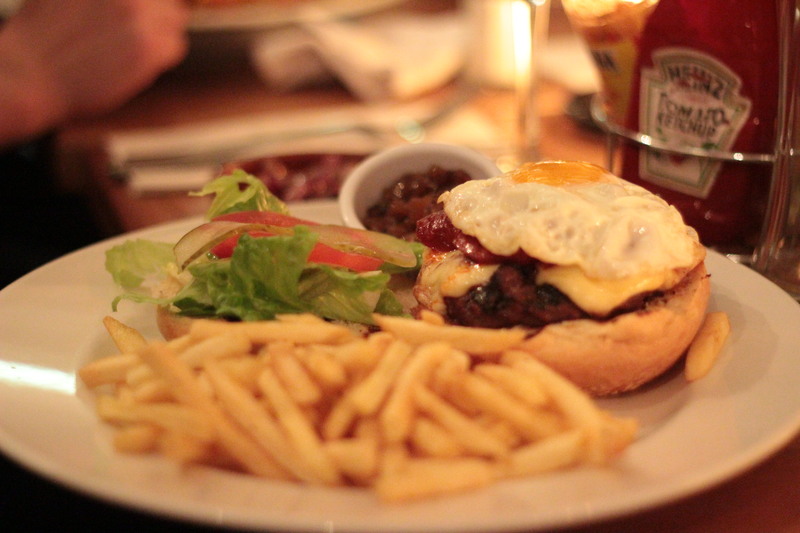 The burger was served open-faced with the fried egg on top. The burger was served with skinny fries, which were decent enough, but nothing overly memorable. Just the same skinny fries you’d find in many other Glasgow restaurants really. I very much enjoyed Ad Lib’s classic burger. There are plenty of options for customisation too, meaning you can pretty much create whatever you want. With all of the new burger joints and menus that have popped up around Glasgow in recent years, I’m happy to report that Ad Lib still stands tall with the best of them. + Lots of topping options available. + Jalapeño tzatziki was delicious, even if there was a bit too much of it on the bun. + Onion relish was superb. – No alternative bun option available. – Fries could have better. 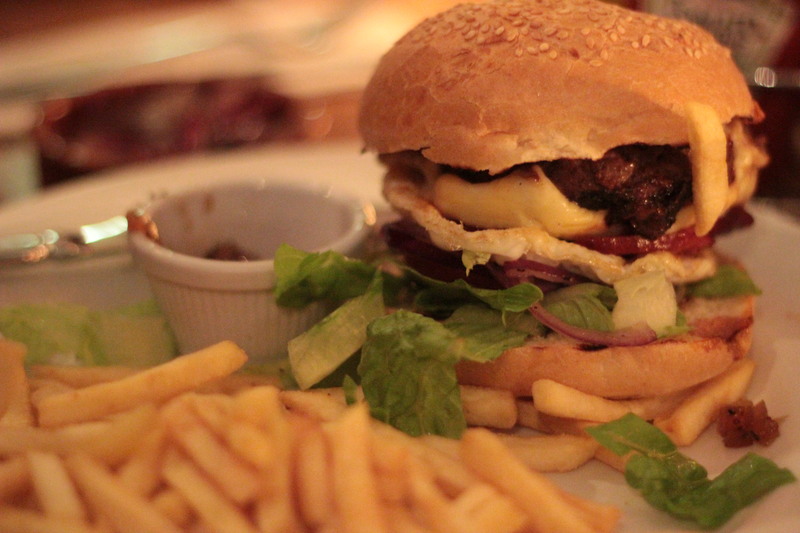 Have you tried this burger? Did you love it? 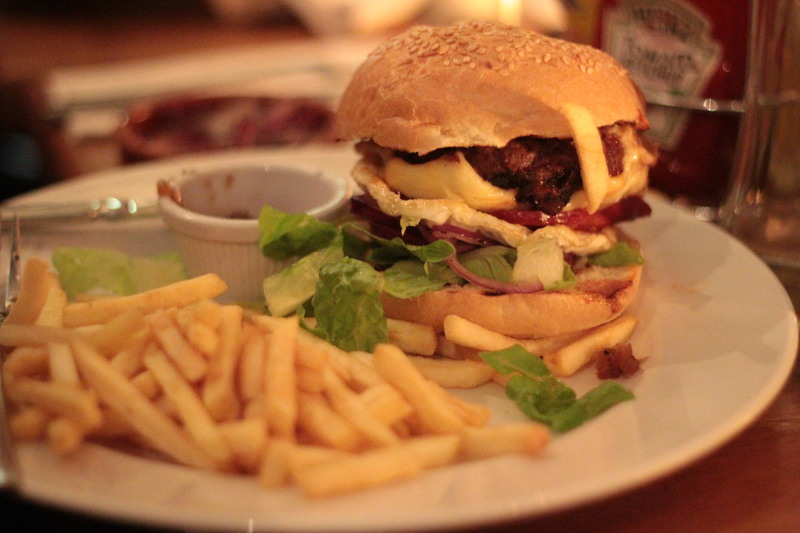 If so, vote for it in the ‘Glasgow’s best burger’ award by clickinghere.